Gorgeous custom built home next to Irongate. Features grand foyer entrance leading into huge living area with 35' ceilings. Formal dining room, large kitchen, built in stereo system and a wet bar that leads out to a built-in gazebo off the back porch overlooking the pond all make this the PERFECT home for entertaining! Owner's suite on the main has a full bath with tiled shower, garden tub, double vanities and enormous wrap around walk-in closet. Half bath off the laundry room with steam shower. Upstairs has a second owner's suite, 2 more bedrooms with bathrooms, an office and large storage closet. Separate entrance for a living space over the 2 car garage. 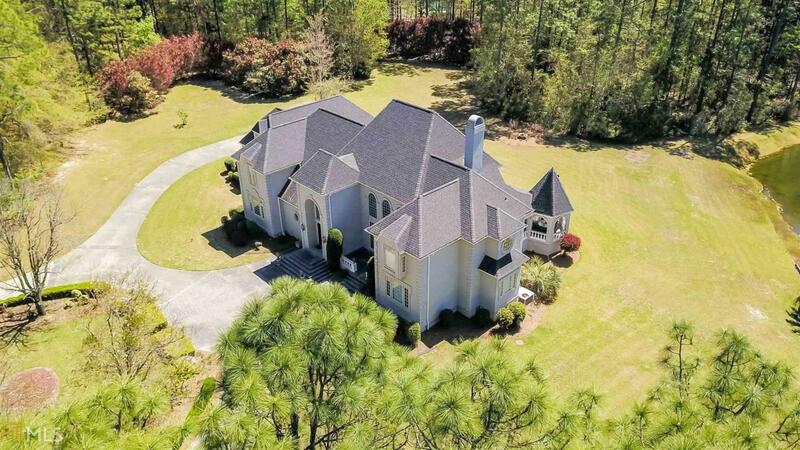 Plenty of privacy and space on 8 acres! 2yr old roof, 2 new sub zero refrigerators & more!